Overall Micromax Unite 2 A106 is a very good phone, but the only problem is with the Data and application installation partition. It is just 1 GB out of which 100-200 MB is taken by the data and system files and we get approx. 700-800 MB to install the applications. It is very less these days because everyone wants to install many applications in their phone as they know it can run the apps. Your phone will be factory reset. Your Internal storage will be wiped out and will be of 200 MB after using this guide. You can revert the process very easily. 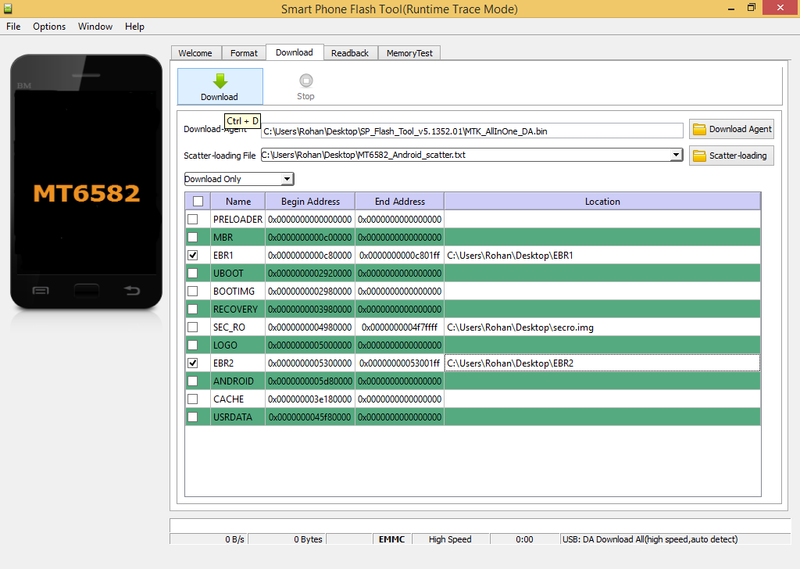 Backup your ROM using ReadBack method (ONLY IF UNROOTED), if you're rooted then make a backup using MTK Droid Root & Tools. Backup your ROM using custom recovery [to external storage]. Backup your Internal SD Card!! Open SP tools..get it from here. Download EBR1 and EBR2 from here. Select the scatter file in SP Tools. Get it from here. Select only EBR 1 and EBR 2 files. Remove and add the battery of Micromax Unite 2. Plug in the USB..Let it finish..Reboot! Download my Stock Firmware backup. Select scatter file from it and flash only EBR 1 and EBR 2 files as you did it before. I tested it on KitKat. Didn't try it on Jelly Bean so I don't know about this buddy. I will check it out and tell you later. Yes, it is possible. You can flash Jelly Bean firmware on your phone even if it is unrooted. I am new to android, can you please give instructions with the help of picture. How to backup ROM (unrooted phone), and if any problem arise, how can i revert back.. Will it void my warrenty? 2. the mass storage on or off ????? Noo!!! Switch of your phone.. then start the "download".. then connect your USB without pressing any buttons..it will flash your phone..reboot! driver software installation after connet my switch off mobile how much take time and gprs data for this the net is slow and low gprs data . What? Plz explain it more. Dude, nothing tough in this...even newbies are doing this guide and succeeded. Can u plz tell me what you did exactly step by step? Just making it now.. ;) I will upload it today only. Don't just switch off your phone. Remove the battery and add it back again..-_- Make sure drivers are installed. If no then ask here. Get a Hex Editor and see online guides. There are too many guides for this..If you have good knowledge of Hex Editor then only try it..It might brick your phone. Lol At least you did it..ROMs are coming. Stay tuned!! opera, burn the rope, google drive, games club, get it, play books, play newsstand, hike, inbuilt office, m! games, mad app, marble and smash it. But now under settings about phone is not working, when i click it it says, Unfortunately Settings has stopped.. :(.. (but no other problems). Did anybody get the same error? PS:resetting the phone solves this problem.. How can i solve this problem without resetting.. any idea..
How to install micromax unite 2 drivers? should we enable usb debugging mode, before flashing internal memory to 2 gb? No buddy!! Just remove the battery and put it again..add the USB and it will install the drivers automatically if u installed them.. Thanks Buddy, i successfully installed drives :), but one doubt still alerts me.. i have installed many apps, when i make apps storage 2GB all will be deleted? how restore apps data? Or not needed? Make a NAndroid backup..then perform the guide n restore data. Your phone must be rooted for Xposed. After 'Xposing', you may unroot your phone and install XMultiWindow app and enjoy Multi window. Hi, will changing the app storage memory to 2GB void my warrenty? Please reply..
Will increasing the app storage memory to 2gb void my warrenty? It won't void warranty because MMX will not check this thing, anyway i they see it you might get in trouble..So first do a readback. i did connect usb after select download but nothing to happen, why ? Driver problems...make sure you followed right thing!! Do I need to root my phone first? Can. I revert these changes later if not need to? No need to root if you want to just increase the memory, and yes. hey dud i did everything you told, turned my phone off removed battery and then inserted, launched SP Tools, selected needed files like EBR and scatter file, clicked on Download and then connected my phone via USB but nothing happened, when i connected my phone its getting charged and nothing is happening. Will it take long time to reboot? Can u temme step by step frm d beginin (r8 from ROM backup). I m not a kinda pro n tis!!!!!!!! Thanks dude, At last I m successfully proceed. But after the completion there is no any internal storage for data/media storage now the total internal storage 2gb only for apps installation. When I go to Settings>Storage there is a option " Mount Internal SD Card" and I select it, after that a notification appears in notification bar/area " Damaged Internal SD Card " when I click on it asked " Format Internal SD Card "
What happens if I select format Internal SD Card and how I remove this notification from notification bar/ area. 4.what is your opinion of this apps like link2sd,foldermount,internal to external sd can these be used for low internal storage and would these apps work on the device??? plz do reply as my decisions are based on your answer!!!!!!!!!!!!!!!!!!!!!!!!!!!!!!! rohan how can i increase ram 2gb without root process is it possible??????? Thnx Bro ! successfully increased the internal memory. so how much is the total space and available space u got after the process without installing anything (stock) will it b enough 2 satisfy the needs?? did you face any low memory internal error??? Can i use it on aosp rom ???? will fone warranty will void after this ?? ?